It's the 19th Century, and you have come to the lush tropical jungles of Amazonas in search of rare plants and animals. You must explore the twisting paths and waterways, leading your expedition from one village to another. Each village offers an opportunity to establish a new outpost. But beware – the Amazonas is not for the timid! Fearsome crocodiles lurk in the tepid waters of the rivers, and hungry jaguars stalk the twilight paths. Do not shy from such dangers too long, for the cost to build a new outpost increases the longer it takes you to reach each new village. Your funds are very limited, so speed is essential. Your sponsor has also sent you a secret directive. You must fulfill the demands of this special mission, or you will lose much of your newly earned fame! Can you face the dangers of an unknown jungle and earn fame and recognition? Or will another explorer surpass you on the way to glory? 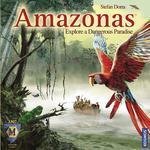 Find out when you enter the land of Amazonas!